The Nissan and Infiniti community has spoken and now Z1 Motorsports is delivering; with the success of Z1 Motorsports’ Two-Piece Akebono Rotors, we are proud to offer Two-Piece Akebono Rotors for vehicles equipped with Nissan / Infiniti OEM Akebono Calipers (09+). These Two-Piece Akebono Rotors weigh up to 33% less than your OEM rotors as a result of our unique two-piece design. By significantly reducing the rotors’ unsprung mass, the Z comes to life, resulting in noticeably more nimble handling, sharper turn-in, and remarkable response, all while allowing the car to be pushed deeper into the braking zone. With the ideal of ultimate performance in mind, Z1 Motorsports’ Two-Piece Rotors are rigorously tested on Z1 Motorsports’ own high-powered street and track cars. Competing in everything from Global Time Attack to local track days to aggressive street driving, the rotors have been repeatedly torture tested while keeping these cars highly competitive. This package includes Z1 Motorsports 2 Piece Akebono Front Rotors AND Z1 Motorsports 2 Piece Akebono Rear Rotors. Our two-piece design drops weight by 10 pounds per FRONT rotor, 5 pounds per REAR rotor, 30 pounds total of unsprung mass. Lightweight rotor hats are machined from forged 6061 aluminum blanks, and finished with heat treating and premium black-hard anodizing. A departure from traditional rotors, Z1 Motorsports’ two-piece configuration also facilitates two modes of cooling. An expanding directional vane cooling tract that is 60% wider than OEM specifications has proven to perform better than straight or pillar style rotors, while the open face design allows for a higher volume of axial air flow. Alloy rotor irons are heat-treated and stress relieved to deliver the best performance in all conditions. This process keeps the disc stable at extreme temperatures and minimizes the effects of warping and cracking, resulting in increased rotor life and maximized performance. Held to precise specifications, rotors are dynamically balanced after assembly and precision parallel ground. 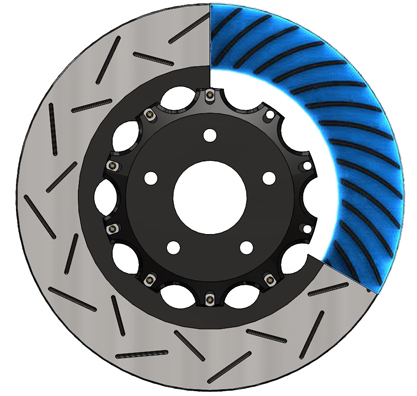 Available in high performance "sprinkle" slotted or drilled & slotted rotor configuration. The rotor is finished off with a tough e-coat (EPD) to keep it from rusting and give it more resistance to breakdown at extreme temperatures. The electronic particle deposition process ensures an even coating of all surfaces and excessive corrosion protection. Fastening hardware includes heat-treated M6 slot nuts and quenched and tempered SAE Grade 10.9 bolts, larger fasteners than the majority of our competitors’ 2-piece brake rotor hardware. These heavy-duty fasteners translate to higher proof strength, especially critical in systems as crucial as braking. Built by enthusiasts for enthusiasts; in addition to top-tier performance, rotor rebuild cost was a priority consideration; also available HERE are the same rotor irons as part of a two-piece rotor rebuild kit. So go ahead, take 30 pounds off the axles, you won't be disappointed.